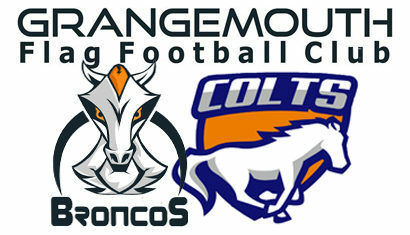 In 2019 Andy will be playing with the Grangemouth Colts in the BAFA Division 1 HNC Conference. 2019 will be Andy’s second year as the starting Quarterback for the Colts. During his first year he learned a lot throughout the season. In 2019 the other teams in the HNC Div 1 should be expected to improve on last year, but Broony’s experience from last year should stand him in good stead. 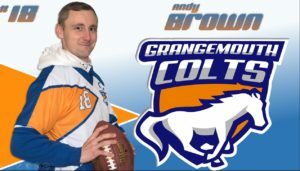 Andy Brown (Broony) started playing Flag in 2013 for the Broncos. He watched the NFL on TV, and after claiming he “would be amazing at that” he was challenged to try out at the Broncos. After his first training session he was hooked. From those early training sessions, where his goal keeper skills made him a natural, he has improved to the point where he is a regular at the HNC Chieftains practice sessions and has secured a place in the Barbarians squad. In 2017 he was invited to travel with the Chieftains to the Big Bowl tournament in Germany, but unfortunately couldn’t due to other commitments. Broony has helped the Broncos to make the League Regional Finals in 2014, 2015, 2016 and 2017. Andy has been a starter for the team on many occasions. In 2016 he was one of the nominations for Defensive Player of the Year. In 2017, Andy has taken on the responsibility of learning the Quarter role for the 2018 Colts.